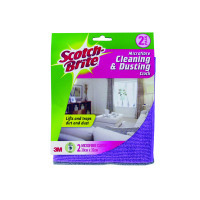 Clean furniture, glass and other surfaces easily and without the use of chemicals with this pack of two Scotch-Brite Cleaning and Dusting Cloths. The soft surface effortlessly removes dust and other debris from furniture, while also effectively cleaning fingerprints and other marks on glass surfaces. Use it wet or dry, depending on the situation, for top results. If it gets dirty, simply wash it for renewed efficiency.